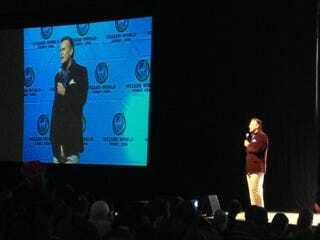 Bruce Campbell was on top of his insult-comic game at Wizard World Austin Comic Con, and the Doctor was on his hit list. It's all in good fun, of course. "Bruce Campbell vs. the Audience" in Ballroom D was a blast. Interrupting each fan question to take jabs at the fan in question - it's an honor to be skewered. Whenever a fan said something Campbell felt was particularly inane or insulting, he'd try to guess what podunk Texas town they were from - Waco, Lubbock, wherever - before inevitably moving on to the next rube. One particular fan came dressed in his finest Doctor number 10 (or is it 11?) ensemble, which prompts Campbell to ask why he needed a tie. Getting the obvious response, Campbell jumps into a tirade on the Doctor Who franchise. "I just found out there's like twelve of them." The audience yells out: "Thirteen!" Laughing this off, he says someone told him their favorite was Doctor number four, then asks the questioner who his favorite is; the fan responds, eleven. Campbell wonders aloud how anyone would even remember which was which, prompting the audience - using the same numbering from last time - to scream, "David Tennant!" Of course, Campbell probably doesn't really hate the Doctor, but he can give him a good ribbing.